Yesterday afternoon after my husband cut the grass, I spent an hour raking the clippings. Some people might not appreciate the mindlessness of raking -- all that repeated reaching and pulling, all those piled clumps of grass dotting the yard -- but, for me, the task offered something that I haven't experienced in a while: margin, that precious white space in life when I'm free to breathe deeply and think unhurriedly. We live in a culture that extols productivity and drive. While these both are good traits, elevating them to such a high status makes us believe that busyness is the norm, something inevitable, something that correlates with importance, something we ought to be experiencing. But if we buy into this worldview (one which often goes unchallenged), it can cloud our self-perception. We assume that if we're not insanely busy, we're probably lazy. If our schedule isn't packed, we're likely not doing enough. If we're well-rested and managing our lives, then we must not be hustling or living up to our potential. Something whispers and prods: do more, do more, do more. You always can do more. I take little pleasure in acknowledging that most of my days are filled to the brim during the semester. Much of this can be attributed to my current phase of life: raising three young kids while working full time (partially from home) as a college lecturer with a full teaching load. 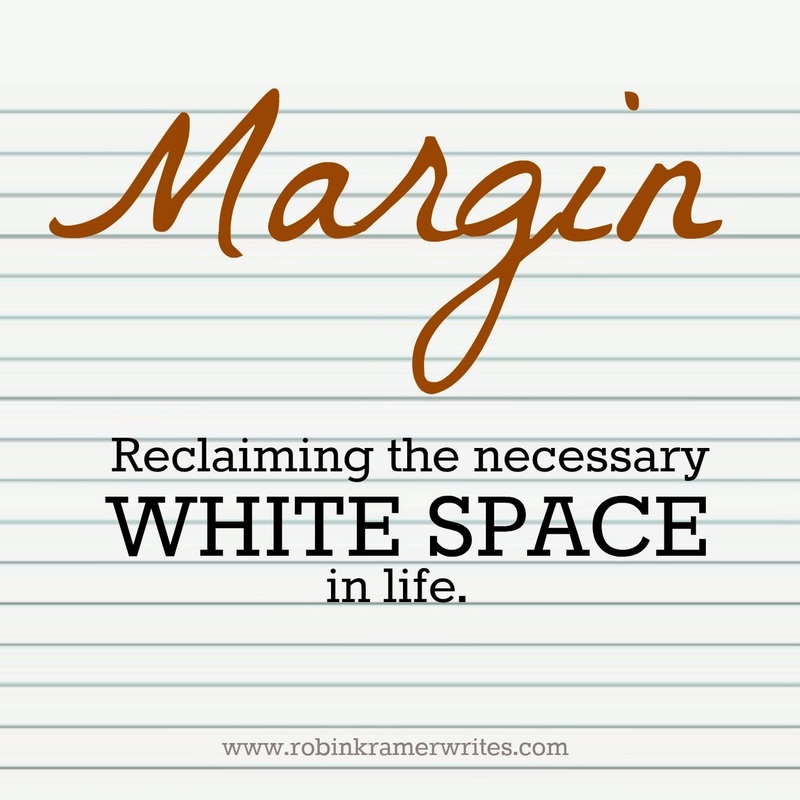 Sometimes, however, my lack of margin stems from choices I make, like taking on too much or neglecting to tap into those things that bring rest to my soul. This afternoon, though, I pushed back on my schedule and reclaimed an inch of margin, one systematic swipe of my rake at a time. I noticed the shifting colors along the mountainside behind my house, felt the pressure of the rake in my hands and the blister forming on my palm, and breathed the October air. My senses were wholly attuned to my yard, one of my favorite places on earth, and my thoughts and emotions, which recently have been scattered, fell into alignment. As I reflected on God's instruction to be still and know that He is God, the simplest of tasks -- raking grass clippings -- elevated from being mundane to being holy and healing. We need white space in our lives -- moments when nothing is scheduled, moments when nobody is pulling on us, moments when we quiet ourselves and reflect. These moments don't come naturally; we need to seek them out and guard them jealously. We need to push back on the unspoken assumption that busier is better. In college I rode the bus everywhere. Other students were always studying or reading, but I always just sat and stared out the window and thought my thinks. It was my time to decompress and organize myself mentally. Some days I really miss the bus. I understand this completely, Ami. I spent a huge chunk of my life being way too busy. My husband and I started our marriage as two full time college students both working full time jobs. It was a very stressful time, and when it was over I was relieved. I think that season in our life served a purpose, but I never want to live like that again. Now I'm a stay-at-home-mom, and life has become less busy. I know many stay-at-home-moms that fill each day with countless trips and activities because they love being busy. I, on the other hand could never handle that. I love being flexible and making time to just relax. When I compared my life to those other mom's lives, I started feeling lazy. But we can't compare ourselves to others. I think we all need a balance between "doing" and "stopping". You hit on so many good points here -- learning from particular seasons in life, having the restraint to say no to activities that would bring stress instead of fulfillment, and avoiding comparison. Preach it, girl! Love this! Our past three weeks have been insanely busy and I have been supremely exhausted. This afternoon, I opted to skip the PTA night at my kids' elementary school and create some margin for us at home. It was such a wonderful, calm, & restful afternoon for all of us. I'm pretty sure I will go to bed tonight feeling more at peace than I have in far too long. Hi Robin! Boy, I really agree with this. When I don't take the time to breathe and get out into nature, or just go shopping on my own, I get tense and blocked. Nothing like a good walk, or a raking job to occupy the body so my mind can take flight. This is absolutely beautiful Robin... and I couldn't agree more. Just this past Sunday I attended a worship service at my church. 1 1/2 hours of worship. I initially debated going... it's 1 1/2 hours, I would be going by myself, I have so much to do... etc. But I made the date with God and met Him there. That time, that space, those margins of completely glorifying Him and worshiping Him has flowed into this week. I am on a joyous high. God seems to multiply our minutes when we focus time on Him, doesn't He?! The sad thing is that in this busy world where we're all urged and encouraged to do more and more people tend to lose focus on God and concentrate on materialism instead. We *are* urged to fall into this trap, aren't we? I want to keep pushing back.